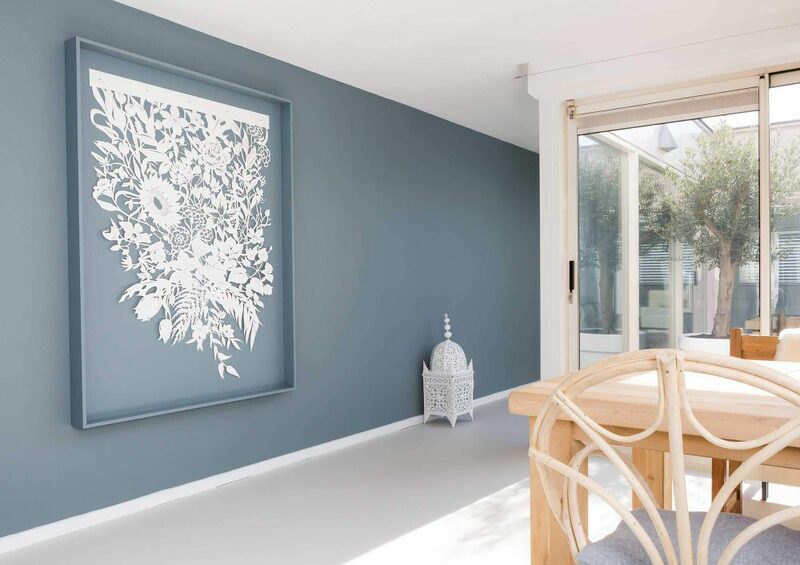 When I was contacted by interior stylist Marianne Luning, she asked me whether I could do a large papercut for one of the interior make-overs they were doing for VT Wonen TV Show. She told me they were doing this make-over in Amsterdam for a couple Müge and Marvin. 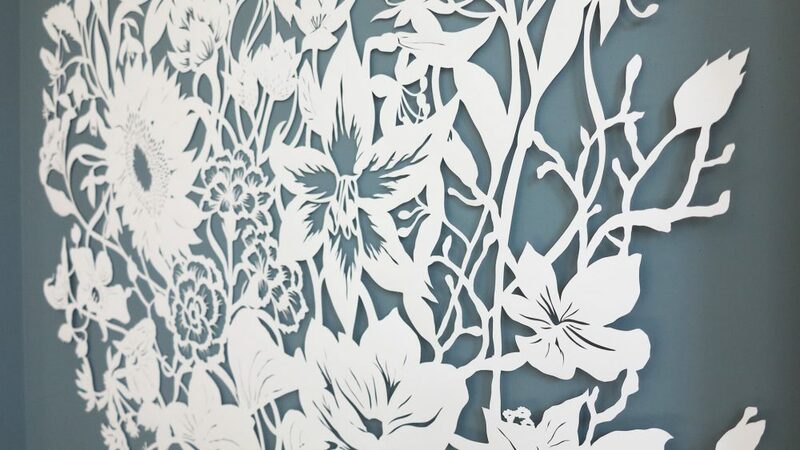 The coupled loved a Boho style, so Marianne wanted this Ibiza / beachy look for the papercut. She also suggested to use two hands in the design, to symbolize the couple. Although I knew the idea for the hands in the papercut wouldn’t work that well in a papercut, I made a few designs to show the options and how it would look. Luckily Marianne agreed with me that it didn’t look like she wanted. I then suggested a more subtile reference to the couple; I wanted to incorporate flowers that would represent the couples countries of origin. As Müge is from Turkey and Marvin from the Carribean I used flowers that were native to these places. And as they are living in The Netherlands I also chose some typical Dutch flowers. 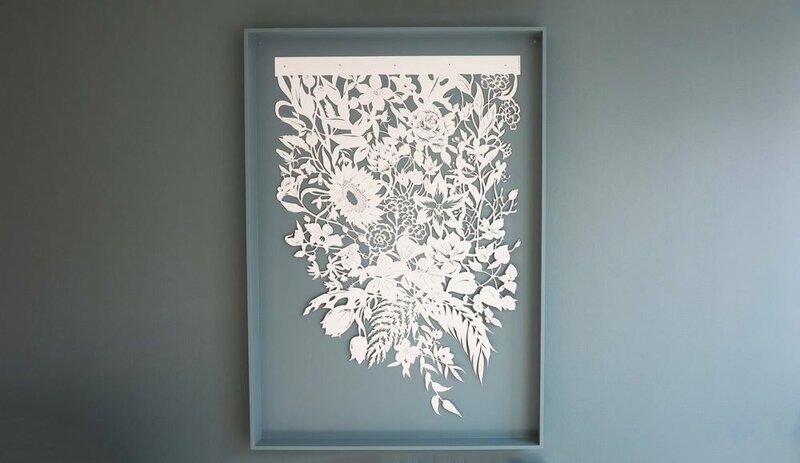 As with all tv productions like this, Marianne changed the plans regarding the size and shape for this papercut quite a few times, to find the best shape and place in the new interior. In the end I designed a very large (1 m. x 1,5 m.) flower ‘draping’. I figured I would cut through two sheets of paper; one with the design on it (very thin paper) and the other the papercutting paper. After putting a large table in the middle of the room, I was ready to start! It almost cost me my back, but I was quite happy with the result once it was all finished. 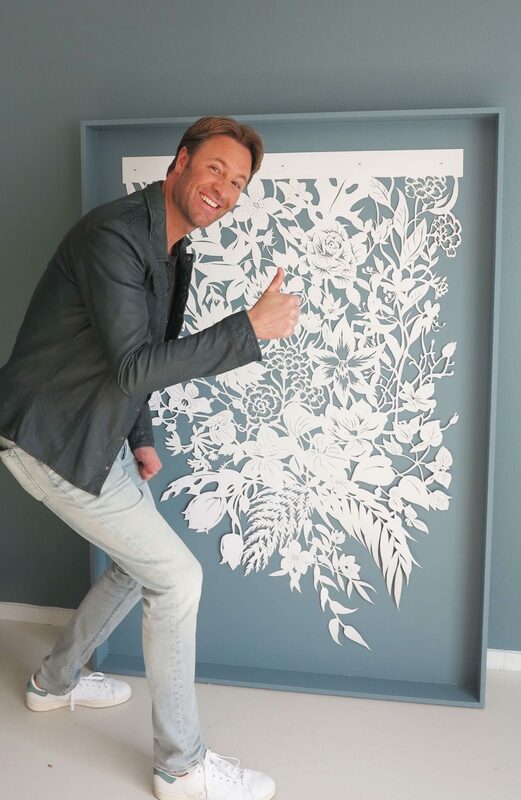 I loved the reaction of tv host Viktor Brand, and I loved how it was hung even more!! 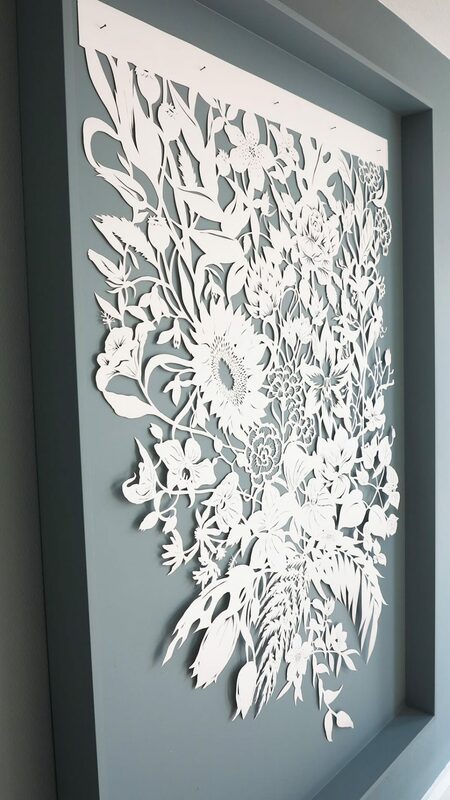 They made a custom frame just for this papercut and painted it in the same colour as the wall. Beautiful, right? 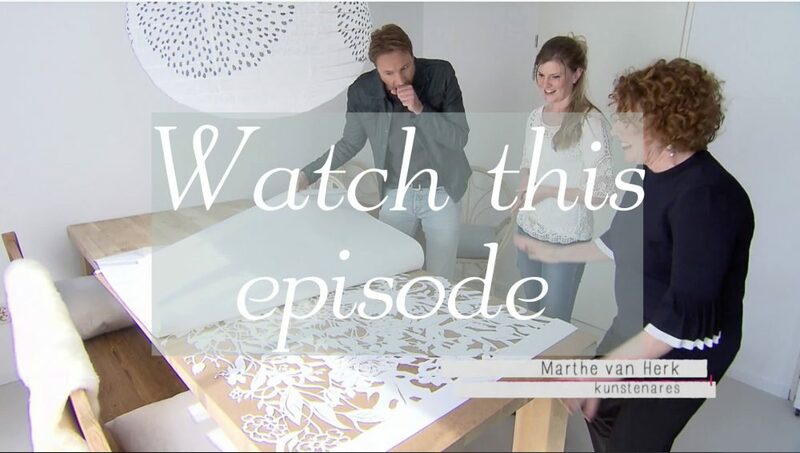 Curious to see the episode (it’s in Dutch), click the link below.